Calling all mushroom and blue cheese lovers! This Mushroom Crostini with Blue Cheese and Thyme is an easy appetizer that is sure to wow your guests! Mushrooms and blue cheese. It seems there isn’t a lot of gray area with these two foods; people either love them or hate them. I happen to LOVE them and can eat them on all the things. And this Mushroom Crostini with Blue Cheese and Thyme is so good, it can even make the naysayers change their minds. Try it for yourself and see. 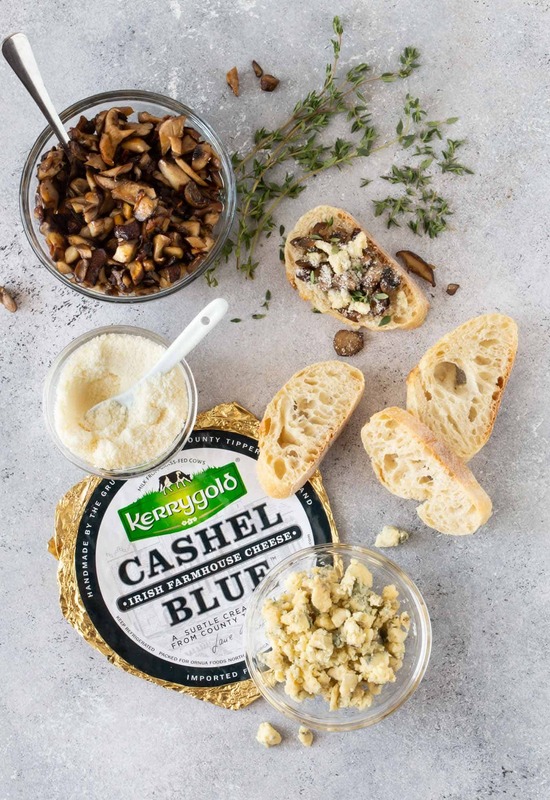 Have you tried Kerrygold® Cashel Blue Cheese? It has a rich and creamy texture that crumbles beautifully making it the perfect topper for this Mushroom Crostini. Not to mention the gorgeous blue veining adds a bright pop of color. A little bit of this tangy, flavorful blue cheese goes a long way, but if you love it like I do, feel free to add more! What kind of mushrooms do you use for this recipe? The sky is the limit. Play around with the flavors and see what suits your palette. I used a combination of white mushrooms, baby Portobello mushrooms, and shiitake mushrooms because I loved how the earthy flavors brought out the rich creamy taste of the Cashel Blue Cheese. But feel free to use your favorite variety or whatever you have on hand. Note: You can make the mushroom mixture the day before. Simply reheat it before serving or serve at room temperature. How do you make crostini? The easiest way is to just warm a loaf of baguette bread and thinly slice it and top with the mushroom mixture and cheeses. If you don’t have time to serve it warm, slice the bread, brush with olive oil and bake for 10 -12 minutes at 375 degrees. Rub a garlic clove on top of the warm bread slices and let cool to room temperature. Buy the crostini already made from your local deli or grocery store. 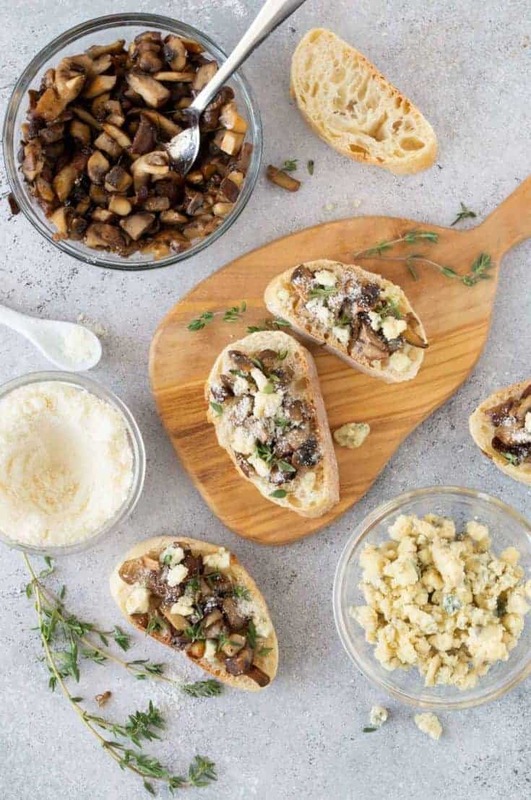 One bite of this Mushroom Crostini with Blue Cheese and Thyme and you will know you hit the appetizer recipe jackpot. The flavor combination of the earthy mushrooms, rich blue cheese, and fresh thyme play well together and make this easy-to-prep appetizer a winner for any gathering. But, please, don’t forget the fresh thyme and don’t substitute dried thyme. The bright flavor of the fresh thyme completes this appetizer. It simply doesn’t taste the same without it. Melt the butter in a medium skillet and add the mushrooms. Cook for 5 minutes and add the minced garlic. Cook until mushrooms are browned, stirring occasionally so the garlic doesn't burn. Remove from heat. Place a heaping tablespoon of the mushroom mixture on a slice of french bread. Top with 1 teaspoon of crumbled blue cheese. Sprinkle 1/2 teaspoon each of grated parmesan and fresh thyme leaves on top. Serve warm or room temperature. What an amazing costini topping! I adore the trio of mushrooms, thyme and blue cheese!